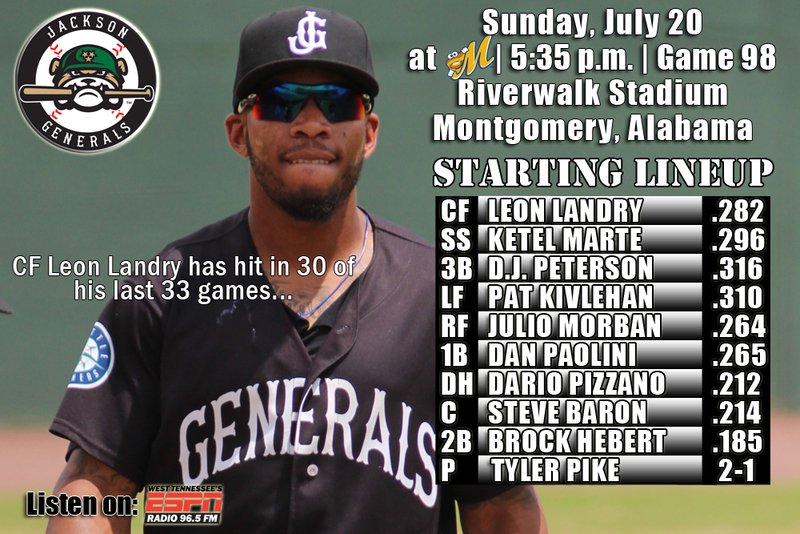 • The Generals and Biscuits play the rubber match of the series today in the finale of a 5-game series at Montgomery (2-2) at Riverwalk Stadium…Jackson is coming off back-to-back series victories at HVL (3-2) and vs. BIR (3-1)…have won 8 of 12 overall…will play 11 games with Montgomery over the course of the final 42 games, 6 coming at Riverwalk Stadium. • The Biscuits spoiled the Generals bid to lock up their third straight series victory with a 6-5 walk-off win Saturday at Riverwalk Stadium. • The loss evened the series at two wins each. Jackson scored four two-out runs in the seventh to take their first lead 5-3, but it was all spoiled by more dramatics in the ninth by the Biscuits. • The walk-off loss also spoiled a chance for starter Victor Sanchez to win his third straight on the mound and be Jackson’s first six-game winner. • Leon Landry (1×5, 2 R, SB) led the inning off with a double. With D.J. Peterson (2×5, R, 3 RBI), Brock Hebert (2×3, R, BB), Ketel Marte (2×5, R). and Pat Kivlehan (1×5, 2 RBI). had hits in the loss. • INF Ketel Marte recorded his 29th multi-hit game on Saturday and he currently ranks 9th in the league in batting (.296), 2nd in hits (110), 5th in triples (6), 6th in stolen bases (19). • INF Patrick Kivlehan was 1-for-5 with 2 RBI on Saturday. He currently has a 2014 Southern League best 28-game road on-base streak going back to May 22nd. • During the streak he is batting .346 (37×107) with 17 runs, 8 doubles, 3 triples, 4 home runs, 26 RBI and 10 walks. He on-base percentage is .405. • OF Dario Pizzano is batting .375 (15×40) this month with 10 runs, 3 doubles, 4 triples, 2 home runs, 13 RBI, 11 walks and posted a .500 on-base percentage. His July OPS is 1.300. • Reigning Southern League Pitcher of the Week Victor Sanchez is currently 2-0, with a 1.44 ERA in 4 July starts, allowing 4 earned runs in 25.0 IP. He has 19 strikeouts and 4 walks, while holding opponents to a .155 average. Overall this season Sanchez is 5-4, with a 3.62 in 15 starts. • July by the numbers – After batting .294 as a team in June, the Generals are currently batting .282 in July, which ranks 1st in the league. The 15 July home runs ranks T-2nd in the league and 9 wins is T-4th. • Extra Extra Bases – The Generals currently ranks 2nd in the league doubles (128) and 2nd in the league in triples (35). They also rank 3rd in the league with 90 stolen bases. scored, 2 doules, 3 triples, 2 home runs, 13 RBI and 6 walks. • OF Leon Landry has hit safely in 18 of his last 19 games, batting .302 (26×86) with 12 runs scored, 3 doubles, 1 triple, 5 RBI and 7 stolen bases. Since June 7, Landry has hit safely in 30 of his last 33 games with 15 multi-hit efforts, batting .338 (46×136) with 20 runs scored, 6 doubles, 3 triples, 7 RBI, 3 walks and 13 stolen bases. During this 30 game stretch he has raised his season average from .236 to .282. • 3B D.J. Peterson has hit safely in 17 of 19 games with Jackson, batting .321 (25×78) with 10 runs scored, 4 doubles, 4 home runs, 8 RBI and 6 walks. Peterson cufrently leads all the Mariners Minors with 23 home runs this season.